The year 2010 was, in the Chinese Horoscope, the year of the Tiger. In truth, the year of the Tiger was like a long winter without end, for me and for many people that I know. ANYWAY 2011 is the year of the Rabbit, who promises to bring a bit more clarity in our lives. I hope it will be so! 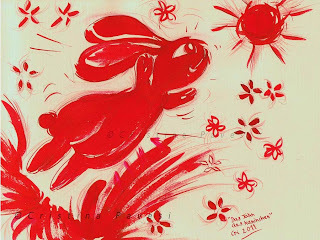 This is a happy tribute to the Rabbit (though its year started already on 14th of February!). I made this illustration with red ink and red pastel pencils, on charcoal drawing paper.